Russia's top cycling team, Katyusha, newly reinforced with fresh blood, have set their eyes on the most prestigious titles 2012 has to offer all at top cycling events all over the globe. Since their launch in 2009, Katyusha have been the pride of Russia. 68 victories, and over 200 podiums – that's what the team have achieved so far. Nevertheless, ahead of their fourth season, Katyusha are aiming to take it to the next level. “The aims are clearly given by the sponsors,” says the team’s general manager, Hans Holczer. “First – the Olympics, the world championships. But the sport as well gives the targets. You cannot make a team of this quality and say that the Tour de France doesn't interest me. But we're focusing on the Olympics. It's the most important goal,” explains Holczer. “But my aim is also to work for the young Russian riders. You should understand this as a whole project,” he adds. Fulfilling those tasks requires elite riders, and Katyusha have added two superpowers to their roster. Here comes the first, one of the most feared sprinters in the business, three-time world champion Oscar Freire. “I'm very happy to become part of this team. First of all, Katyusha represents such a huge country as Russia at the international cycling arena, and it's a big honor for me. This team is very strong, and has huge potential to improve, meaning a great deal of opportunity for me to claim more wins in my professional career,” says the Spaniard. Meanwhile, Katyusha's biggest pre-season signing, Denis Menshov, is the only one on the team to have tasted overall victory at two of the world's three major events. 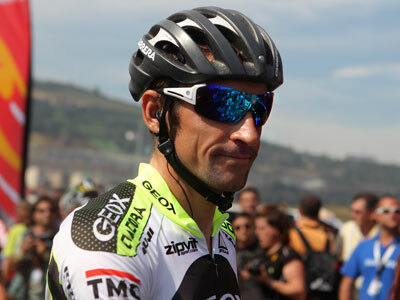 The 34-year old Russian proved to be the best at the Giro d'Italia in 2009, and twice at the Vuelta. With half a year left to go before the summer Olympics in London, Russia's top cycling team and top cyclist have pooled their interests. “I think it's a very good combination and it suits me well! If you finish the Tour de France in good shape, you can perform at the Olympic Games at the same level. If you're not good enough during the Tour, you still have two weeks to improve,” says Menshov. Katyusha look to have everything needed to make this year one of the most – if not THE most – successful for Russian cycling.